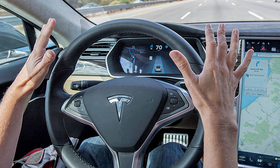 Tesla CEO Elon Musk cautioned in October 2015 that the hotly anticipated Autopilot function was still in beta mode. WASHINGTON/SAN FRANCISCO -- Tesla Motors Inc. says the self-driving feature suspected of being involved in a May 7 fatal crash is experimental, yet it’s been installed on all 70,000 of its cars since October 2014. Tesla’s use of technology still in development, while common in its Silicon Valley home, contrasts with the cautious method of General Motors and other automakers that have restricted their semi-autonomous cars to test tracks and professional drivers. It’s permitted because U.S. regulators have taken an intentionally light approach to encourage innovation. The U.S. National Highway Traffic Safety Administration said last Thursday that it is investigating the crash, which comes as the regulator says it is looking for ways to collaborate with the industry. The agency negotiated an agreement to speed the introduction of automatic emergency braking earlier this year, frustrating safety groups who say they had no input and said carmakers’ pledges to install the technology couldn’t be enforced by law. NHTSA is expected to announce guidelines as soon as this month that will set some parameters for self-driving cars on U.S. roads. Transportation Secretary Anthony Foxx told reporters last Wednesday the agency would be as exact as it could without being overly prescriptive. In January, Foxx and NHTSA chief Mark Rosekind announced in Detroit that they would allow automakers to demonstrate the safety of autonomous vehicles and apply for exemptions to existing safety rules. They said the government shouldn’t stand in the way of technological progress. In the Florida crash, Tesla’s so-called Autopilot semi-autonomous driving feature failed to detect the white side of the tractor trailer against a brightly lit sky, so it didn’t hit the brakes, according to the company. That kind of trial-and-error technique is far different than accepted practices in the auto industry, said Joan Claybrook, another veteran auto-safety advocate who ran NHTSA in the 1970s. Automakers work for months, even years, to refine safety technology so it’s reliable enough for the public. If they miss, car companies know they will be on the hook for costly safety recalls. Autopilot doesn’t make the cars fully autonomous. Designed chiefly for highway use, it takes over steering and engages an adaptive cruise control to adjust speed without driver input. The car will change lanes if the driver puts on a turn signal, and there’s automatic emergency braking if it senses a crash is imminent. It uses cameras, radar and digitally controlled brakes to take over all those functions from the human driver. Autopilot alerts drivers if it loses confidence in its ability to drive, Tesla said in an e-mailed response to questions. If the system doesn’t sense the human operator has re-engaged, the cars will gradually slow down and eventually come to a complete stop and flash the hazard lights. BMW announced its own self-driving car venture Friday, partnering with Intel and Mobileye, aiming for cars on the road by 2021. Even on the day of the announcement, company executives were cautious about the limits of technology that allows people to drive hands-free. In February, a Lexus-model Google self-driving car hit the side of a bus near the company’s Silicon Valley headquarters. The vehicle was in autonomous mode going about 2 miles per hour around sandbags in the road. Google’s software detected the bus but predicted that it would yield, which it did not, according to a company report about the incident. There were no injuries reported at the scene, the company said. “In this case, we clearly bear some responsibility, because if our car hadn’t moved there wouldn’t have been a collision,” Google said in its report. Google says its cars have covered 1.5 million miles and are currently being tested on the streets in Mountain View, California, Austin, Texas, Kirkland, Washington, and the Phoenix metropolitan area. It’s testing both the specially built iconic “koala” cars and Lexus SUVs retrofitted with Google sensors and software. A test driver accompanies every vehicle “for now,” according to the company website. Consumer groups have been accused of being anti-technology, even though they’ve pushed for mandates for things like airbags and electronic stability control, said Gillan of Advocates for Highway and Auto Safety. They’re against allowing things into the market before they’ve been proven to work.